Chef Juan knew he liked cooking after taking a cooking class in his native Puebla, Mexico, but the opportunity to put that learning into practice didn't come right away. "When I first came to the U.S. 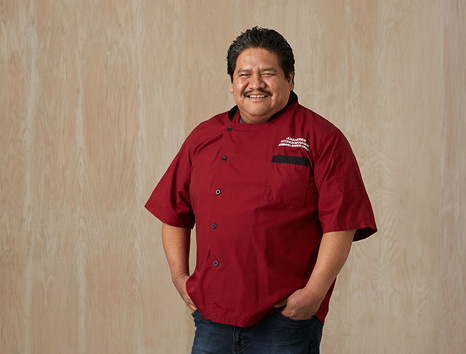 I started working at a car wash, then jumped to kitchens," says Juan. "I was a dishwasher, then a prep cook, then a line cook." When the chef he worked under left for a management job, Juan took his job. Seventeen years later, he's still leading the kitchen...and doing what he likes. "I like cooking," Juan says. "When we're all working well together, it's really fun. When it's a full team, it's like a well-oiled machine...(but) my favorite thing is actually my day off," he jokes. Juan takes his time off seriously. "I like to rest, but most of the time I'm catching up on the things that need to get done," he says. "When I'm on vacation, I go out and enjoy the nightlife and visit family. There are eight siblings in my family: four in the U.S. and four in Mexico. But here, Food Fight is my family. The people I work with, the owners that treat employees well...it's a human business. Food Fight is in a class of its own. It offers opportunities for everyone who wants to put forth the effort."